Perhaps the primary rule of golf is to play the ball as it lies. There are several circumstances, however, under which a player may lift the ball and drop it elsewhere to get relief from certain conditions. Relief is often based on finding a reference point called the nearest point of relief, which is defined in the Definitions section. It is the spot nearest to where the ball lies, and not nearer to the hole, from where a player can make the stroke the player would have made from the original position had the interference from which relief is being sought not been present. In finding this point, the player must simulate the address position and stroke, with the same club, and swing in the same direction, as if the interference from which the player is taking relief were not present. For example, if a player would have made a right-handed stroke with a 4-iron toward the green were the condition not there, that is the stroke he must simulate to find the nearest point of relief. The nearest point of relief from a particular spot might be different for a right- and left-handed golfer. Determining the nearest point of relief can get tricky. If it appears that the nearest point of relief is an unplayable lie, such as tall grass, this does not change where the nearest point of relief is. In this case, the player might choose not to take relief and to play the ball instead from where it lies. After finding the nearest point of relief, the player must hit the ball in the same direction that was used to find that point. If playing from the nearest point of relief means a club different from the one used to determine the nearest point of relief is now a better choice, the player may use the different club. It is possible that the nearest point of relief is inside an object, like a tree trunk, or cannot be physically determined because a barrier prevents taking an address position. In these cases, the player must estimate where that point would be if those complications were not there. 4. 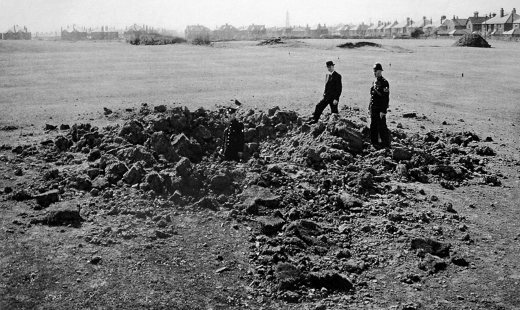 Shrapnel and/or bomb splinters on the fairways or in bunkers, within a club’s length of a ball, may be moved without penalty, and no penalty shall be incurred if a ball is thereby caused to move accidentally. Most writers would try to come up with a witty comment on each rule, but they exceed anything I could even imagine. Play well, and have fun. And play in peace. Maybe not the hardest shot in golf, but certainly the most unnerving, is the opening tee shot. No matter how well you warmed up, you can’t help but wonder what’s going to happen today. There’s a host of doubts that could be running through your head, but if there are, it comes down to this. You warmed up your swing but you forgot to warm up your mind. Isn’t that the point of your warmup, to get ready to play? If all you do is hit balls to remember your swing and smooth out any loose shots that appear, the exercise is all you got. The warmup is meant to accomplish three things: establish clean contact again, establish your swing tempo, and get your mind into playing mode. That last one is the most important. One thing you will hear about your pre-game warmup is not to start correcting faulty shots. The reason for that is doing so warms up the wrong part of your brain. You want to engage your subconscious mind, the one you can’t have a conversation with, the one that responds to what it sees on an intuitive level. When you have a ball in front of you, look downrange, pick a shot, and hit it. Don’t judge the result. If you have a slice that came from nowhere, let it go. Hit lots of wedges and fewer shots with the longer clubs. Swing, hit the ball. Swing, hit the ball. Make it no more complicated than that. All the while, practice looking first to find a shot and hitting the shot you see. When you step onto the tee box, stay in that mode of thinking. Look down the first fairway and see what needs to be done–where you want to hit the ball and what club will get it there. The big mistake would be to hit the shot you hit the last time you played this hole. Respond to what’s there now. Let the needs of the shot you see infuse themselves into you and respond to that feeling. Then go through your pre-shot routine as you would for any other shot and play away. The more often you can start a round in this way, the easier this shot will get over time, and the more you will start playing every shot this way. Your only limitation will be for how long you can sustain this kind of concentration before you get back to analyzing again. With practice, you will be able to keep on for the entire round, but it all starts with your warmup, validated by playing the first tee shot the right way. When I write these posts I like to keep two rules in mind. First, write only about things that a reader can learn from reading the post. If something is experiential, too open to interpretation, I won’t write about it, because I don’t want a misinterpretation to send anybody off in the wrong direction. Second, keep my own game out of it. What applies to me may not apply to you and may even be detrimental to your game. I try to write about golf’s universals–things that anybody can put into their game and become a better golfer. This post breaks both of those rules, but I want to mention it for whatever it’s worth to you. If it makes you think about putting a bit differently and encourages you to make explorations on your own, even if they don’t end up where I am now, that’s fine with me. Since my back surgery seven weeks ago, I have been putting. Nothing but putting. You can imagine that with nothing else about golf to distract me, I am getting to be a better putter than I was before. One problem I have been trying to solve for many years is how to take the putter back smoothly from the ball and in such a way that the putterface doesn’t open so that it can’t get square again when it gets back to the ball. That sound like two things, but it’s all of the same piece. When the putterface moves in that way, returning to it your carefully positioned starting point is seldom going to happen. As a consequence, having the ball go where you intend to putt it will seldom happen, too. Another putt you should have made gets missed. A few days ago I fell into doing this one thing which seems, so far, to have cleared up the problem. 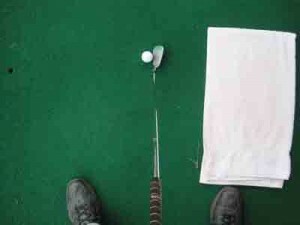 My first move back is to take the handle of the putter back with a very gentle push by the left hand. The putterhead stays where it is for only the merest instant before it starts back, too. This move is so subtle that if you were looking casually you wouldn’t notice the lag between the handle and the head of the putter. That lag also puts light pressure into the palm of my left hand, since for an instant the handle is moving but the head is not. I maintain this pressure throughout the stroke. The result is that the putter has no Y-axis drift, and the putterface stays where it needs to be to return to the ball squarely. I feel like Zach Johnson looks. There’s more to it than this, in that this move is combined with my particular stroke, which I’m not going to try to describe (Rule 1). I need to check out Eddie Merrins’s book, Swing the Handle – Not the Clubhead, to see if this is what he had in mind. Incidentally, I tried this same move with a driver (not swinging in fully, because I’m not up to that yet, but just making a takeaway) and it feels promising. Like I say, this is my personal exploration, and I found something that means something to me. If this opens you up to new possibilities, so much the better. The only thing I would remind you of if you want to try it for yourself is the subtlety of the movement. The added pressure in your left hand is very slight, and the lag in the motion of the putter is almost unobservable. More in those two things might not be the ticket. I would bet that a touring pro could play one round at your course and know it better than you do. It’s their business to get familiar with a course as fast as they can so they know the most efficient way to move the ball from tee to green on every hole. These are some things you should know about your course, or any course you play. After you have played a course one time, you should know which club you will tee off with on every hole and where you want to put the tee shot. The first time around, write down on the scorecard the club you used if that is the one you would use next time, otherwise the club you should have used. When you get to a point in the fairway where you would like to have your tee shot end up, take a look back to the tee and then ahead on that line to find something in the distance you can use as an aiming marker from the tee. It might be a certain tree, or a neighboring building. On one course I play, the architect did a good job of hiding the fairway, so having a good idea of where to aim your tee shot is the only secure way of hitting it. On par-5 holes, figure out what strokes to play, and to where, so that you have a money shot into the green, such as your 9-iron or an 85-yard pitch. On par-3 holes, especially the longer ones, see if there is a bail-out area to which you can safely play in order to avoid hazards and yet have a good chance for a chip and a putt. Notice as you go around the course where you can get a good look at the pin position on greens that you have yet to play. One course I play frequently has an access road you can drive down that lets you see the pin placement on seven of the front nine greens. Learn which hazards are in play for you and which ones you can ignore. Find places that are not hazards, but will nonetheless cost you strokes if you hit there. 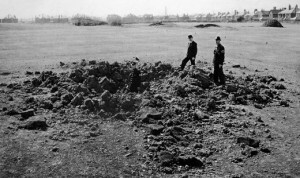 Sometimes bunkers are not meant to be hazards, but directional indicators. You’ll find bunkers like this on par 5s and long par 4s. You aim a shot at them or just off to the side in order to put your ball in a good position for the next shot. On any hole, learn to which side of the green you can safely miss and which side is to be avoided. The usual reason is that it is easier to chip to the hole from one side than another, either because of the condition of the ground, or that the green is more or less receptive to a chip. Learning the breaks on the greens takes more than a few rounds, but you should at least know if there are one or two greens that are faster or slower than the rest, and the general slope on every green. Don’t make golf a game of chance. In one time around a course, no more than two, you can learn what a course will give and what it will take away. Seek the first, avoid the second. It’s that simple. Is the High Side of the Hole Really the Pro Side? One of the first pearls of wisdom that every new golfer acquires is that on the putting green there is a “pro” side of the hole and an “amateur” side. Professional golfers always miss the hole on the uphill side, so the wisdom goes, and amateurs continually miss on the downhill side. So to have at least something in their game that looks like they’ve been around the block, these golfers will start trying to miss putts on the high side, and every now and then accomplish it. The reason for preferring the high-side miss is not hard to understand. A putt that approaches the hole from above might curl in or catch the lip on the way past and fall in. At least there’s a chance, which is not the case with putts that pass by on the downhill side. The only way the ball would then go in the hole would be to stop and head back uphill. I’ve never seen that happen and I doubt I ever will. Miss on the high side, not the low side. Case closed. Or is it? Remember that all this makes a difference when our object is to have the ball fall into the hole. While we would like every putt to do that, most golfers distinguish between putts that are makable and ones they lag up to the hole for an easy second. How long is a sidehill putt that most recreational golfers would consider makable? Eight feet? Ten? After a point, the goal becomes leaving the ball close. For those putts, the pro side and amateur side change places. The purpose of a lag putt is to leave the ball close to the hole, AND in a spot where the next putt is as easy as possible. If you miss on the high side and leave it on the high side, or leave yourself with a sidehill comebacker, you haven’t helped yourself out. A putt that goes straight uphill, which you earn by missing on the low side of the hole, would be much easier. Depending on the slope, three feet straight uphill could be a more inviting play than a downhill slider of half that length. Then again it might not be, but thought needs to be given. The point of any golf shot, from tee to green, is to leave the ball in the best place for the next shot. Indeed, we might not even be talking about putting. If you have a greenside chip of about 50 feet, you aren’t thinking of holing out, but of leaving yourself with an easy putt for the up and down. If there is a downhill side near the hole, that’s where you would want to leave your chip. Guidelines are only guidelines. Wisdom is not a command. The fine points of playing golf serve merely to lead our thinking along relevant lines. We must never forget the primary rule of course management: look at the course and adjust to what is there. I would bet you give away at least two strokes per side because you don’t play the game as well as you should. That’s not your shotmaking, but the decisions you make. Here are a few ways you can start lowering your handicap tomorrow, and it doesn’t take any practice time to do it. These are nine good ways to get back those wasted strokes. 1. Hitting recovery shots off the tee shot. – if your course has heavy rough or lots of trees, you can use up several shots every round just chipping the ball back into the fairway. On a course like this, leave your driver home. 2. Playing over water. – Bad things happen when you play over water if you don’t have to. Figure the longest club in your bag that you’re sure you can get in the air. If you have to hit a longer club than that to clear the water, go around or lay up. 3. Not seeing the golf course (until it’s too late). – For example chipping into slopes or soggy ground that you hadn’t noticed, ignoring pronounced slope around the cup, little things that are right there that you don’t see until after you hit the shot. 5. Getting angry. – You’re not as good as your good shots, nor as bad as your bad ones. Accept what happens and move on. 6. Playing with the distance you want, not the distance you have. – If 155 yards with a 6-iron is a good shot for you, and you’re 153 yards from the pin, don’t hit the 6! Take out a 5-iron, grip down, and put a smooth swing on the ball. The extra club in your hand takes off the pressure and you’ll hit a better shot. 7. Two short shots in a row. – At the professional level, the short shot takes the place of the approach putt. At the amateur level, the short shot is meant to get the ball on the green. Getting the ball close to the pin is secondary. Whatever it takes, get your first short shot on the green, two-putt close at least. 8. Not aiming your greenside chips. – When the ball is close enough to the green that you truly can give it a run at the hole, line up the shot like you would an approach putt. This avoids hitting your chip hole-high but four feet to the left and gives you a chance to leave the ball tap-in close or even sink it. 9. Not taking lessons. – Don’t hit from the rough very well? It’s not hard to do. Do uneven lies give you fits? They shouldn’t. Can’t hit the chip from 30 yards? Simplest shot there is. Get a list of shots that give you a hard time and have a pro show you how to hit them. I don’t understand why so many golfers I talk to won’t do this. I just don’t. Please comment if you have any more ways for us to save shots like this. Many times when you hit a bad shot it’s no surprise. You knew it was likely to happen because of the anxiety you were feeling before you even stepped up to the ball. Maybe you were looking at a tee shot into a tight landing area. Maybe it was a downhill slider on the putting green. For some reason the shot intimidated you. When that happens you get nervous and there is little chance of hitting your best shot or something close to it. What to do? You could do what the mental game gurus say to do, like get a pre-shot routine and follow it, as if that would distract you from your worries. Or you could do a short breathing exercise before you step up to the ball. There are all sorts of looney things in the mental game literature that don’t get to the heart of the issue, which is, you care too much about something you shouldn’t care about at all. Look at this. You’re out on the golf course for some recreation, the company of your playing companions, and getting some exercise. Golf is a vehicle for all of that, and there’s no need to make any more of it. Yet, for some reason, we do. That is where the problem lies. The solution to the problem is to play like being out there is enough and let the rest of it be what it may. I don’t mean to play indifferently. Please, do your best. If you’re not going to try to do your best on the golf course, then go do something else you feel motivated to be good at. I mean to do all you can before and during the stroke to hit your best shot, realizing all the while that where the ball ends up is nothing more than the next place from where you will be hitting it. Right now you probably judge each shot after you hit it. Based on what you wanted to do, this one was good enough, this one wasn’t so much, that was a great one, and so on. You gotta stop doing that. Good ones and bad ones. Just hit the ball and move on. When you get into judging mode, you’re chasing success, but that brings up failure, too. Success and failure are a matched set. The problem with that is, failure rules. Have you ever wondered why one critical remark stays with us so much longer than a dozen compliments? It’s left over from our early past as proto-humans when failure could mean being eaten rather than getting to eat. We don’t live in that kind of life-and-death world anymore, but the wiring is still there. We too easily stop giving ourselves the freedom to succeed and center instead on avoiding failure. There’s little we can do to prevent others from making stray remarks, but why on earth would we do it to ourselves, which is what you do when you get into the success-failure trap? There’s nothing on the golf courses I play on that is a life or death affair. You hit the ball, find it, and hit it again. If the ball goes in the water, drop another one and keep playing. When golf gets any more complicated than that, it’s because you made it that way, and there’s not reason for you to do that. So, stop doing it. Just stop it. You might say, I try not to, but I just can’t help myself. Oh, yes, you can. You have to build up a little willpower, which is the condition of your mind that has the courage to do things you know are right. Figure out the shot you have a good chance of hitting successfully, hit that shot, and when it’s over, it’s over. No judgements, good or bad. It’s especially important not to judge your good shots, because that leads you into judging your shots by a standard that you are not going to meet all the time, which leads to disappointment when you fail to meet it, which leads to worry, and the cycle of caring too much has begun. Control your mind, not your swing. Pop quiz. Why do you want to relax on the golf course? If you say, so you can hit good golf shots, that’s the wrong answer. You’re still in caring mode. The right answer is, being mentally relaxed is the best way to live, to experience life, and to enjoy life. Golf is part of enjoying life. Practice because you enjoy practicing. Play because you enjoy playing. Out of that will come good golf shots and satisfying scores.